Watch highlights of CBA’s 5-1 state playoff win over Pingry Christian Brothers Academy used a four run 5th inning to propel the Colts to a 5-1 win over Pingry in the Non-Public, South A state baseball tournament. The game was suspended on Friday after two scoreless innings and the home team trailed 1-0 in the fifth. Coach Marty Kenney’s team got going starting with a Trey Nelson RBI single to right that scored Andrew Buccalotto. Then, Ryan Ramiz laid down a high bunt on the third base line. Ramiz beat the throw to first and pinch runner Brendan Shaw slid under the tag to give CBA a 2-1 lead. John Moschella capped off the four run frame with an RBI single to make it 4-1. The Colts will face Paul VI on Tuesday after the #12 seed upset St. Joseph’s Metuchen 14-0. CBA is also alive in the Shore Conference Tournament. The Colts face RBC on Wednesday in Red Bank. Watch highlights of a great pitcher’s duel in the Shore Conference semifinals Trey Nelson’s grounder to first with the bases loaded brought home the winning run as CBA advanced to the Shore Conference Tournament finals with a 2-1 win over RBC in Red Bank. The game was highlighted by two stellar pitching performances. Colts sophomore Luca Dalatri threw eight innings giving up just one run and striking out ten. RBC senior righty Alfredo Molina struck out 13 batters and gave up just two hits on the night. The Colts scored on a fielders choice in the second and RBC got the equalizer on a sacrifice fly in the fourth. Molina scored the Caseys lone run with a head first slide on the sacrifice fly. He made a key strikeout with runners on 2nd and 3rd in the bottom of the 7th to force extra innings. Even though the game was at RBC’s home field, the Colts were the home squad as the higher seed. Dalatri closed out his night with a strikeout to end the top of the 8th. Molina saw his 13th strikeout victim reach first base on a passed ball, then he hit a batter and issued another walk before Nelson simply put the ball in play. The grounder to first saw the throw home go well wide and give CBA a matchup with Barnegat in the Shore Conference Finals set for 8pm on Sunday night at First Energy Park, home of the Lakewood BlueClaws. Watch highlights of the Lancers upset win in Lincroft along with post-game reaction Joe Rotelli drove in five runs and St. John Vianney piled up six runs in the final two innings to upset CBA 13-9 in the semifinals of the Non-Public “A” South semifinals. The Lancers raced out to a 2-0 lead in the first inning and never surrendered the lead. The Colts tied the game at two in the second, but St. John Vianney answered with three runs in the third. CBA would get within 7-6, but the Lancers got a clutch two out hit by Chris Morris with the bases loaded in the sixth, followed by a two run double with the bases loaded in the 7th by Chris Loney to make it 11-6. The Lancers added two more runs in the final frame. CBA answered with three in the bottom of the 7th but fell short. Rotelli was 3-4 with 5 RBI, Loney was 3-4 with 2 RBI and four runs scored. Morris pitched four innings of relief giving up five runs to pick up the win. St. John Vianney opened state tournament play with a 10-0 upset of #1 Bishop Eustace. The #8 seed then topped the 4th seeded Colts. The Lancers go for the Non-Public South “A” title this Tuesday at 4pm against second seeded Gloucester Catholic at Rowan University. CBA plays for the Shore Conference Tournament title on Sunday night against Barnegat at First Energy Park, home of the Lakewood BlueClaws. Watch highlights and post-game reaction of CBA’s 2-0 win over the Bengals at First Energy Park in Lakewood Will Morgan drove in a pair of runs and Luca Dalatri closed out his sophomore campaign with a complete game shutout and nine strikeouts to give CBA a 2-0 win over Barnegat in the Shore Conference Tournament on Sunday night at First Energy Park in Lakewood. Both Dalatri and Barnegat starter John Corbett were pitching on three days rest. The Colts jumped on Corbett in the first as Ryan Ramiz led off the game with a slicing double down the left field line. Two batters later, Will Morgan hit a high fly ball to right that landed for a double to plate Ramiz and give CBA a 1-0 lead. Corbett settled down nicely after that, giving up just a Morgan sacrifice fly in the third that scored Ramiz to make it a 2-0 game. [selfie] Dalatri got into a jam in the fifth inning giving up a bloop single to right and a walk with no outs. But the sophomore struck out three straight Bengals batters to keep it a 2-0 advantage. Dalatri finished the game with nine strikeouts. The right hander fanned the final two batters of the game to give Chirstian Brothers Academy its fifth career Shore Conference Tournament title. Dalatri’s sophomore campaign closes out with an 11-0 record on the hill. Both teams were coming off losses on Friday in state tournament play. 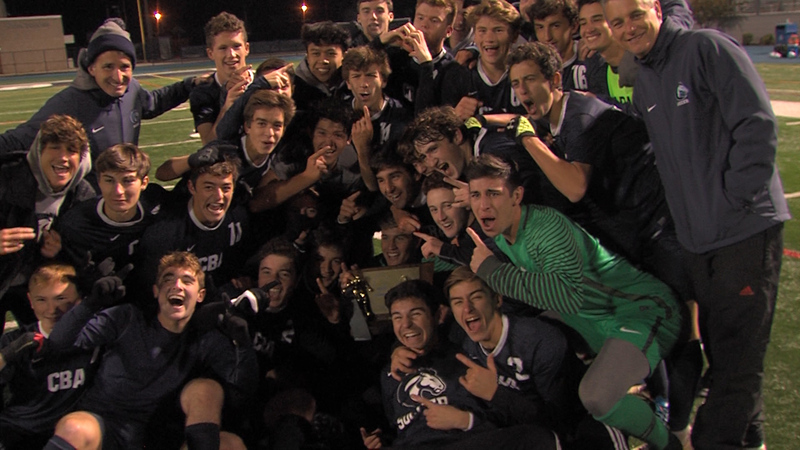 CBA was upset by St. John Vianney at home, while Barnegat fell to Buena 1-0 in the Group II final. TJ Bryan looks back on CBA pitcher Luca Dalatri’s tremendous 2014 campaign for the Colts Shore Sports Zone cameras saw Luca Dalatri’s final two starts of 2014. First it was eight innings and one run against RBC in the Shore Conference semifinals, then on three days rest, he threw a complete game shutout against Barnegat to give the Colts a Shore Conference title. What makes Marty Kenney so excited about his pitcher? He gets two more years to work with him and despite his stellar success, he’s hungry to work harder and improve his already tremendous array of pitches. Another big key to Dalatri’s success on the hill is fellow sophomore Brandon Martorano. The Colts catcher has already made a commitment to play college baseball for the North Carolina Tar Heels and will spend the next two seasons forming one of the best batteries in New Jersey high school baseball. SSZ gets in the Zone with CBA first baseman John Moschella and a must see bonus interview with his Grandpa! Shore Sports Zone brings you two boys high school soccer Shore Conference showdowns Shore Sports Zone brings you highlights of two Tuesday afternoon Shore Conference boys soccer matchups: Manalapan 2 Freehold Township 0 Eric Wilkinson scored late in the first half and Mitch Volis got an insurance tally late in the second half to give the Braves a victory over the Patriots. 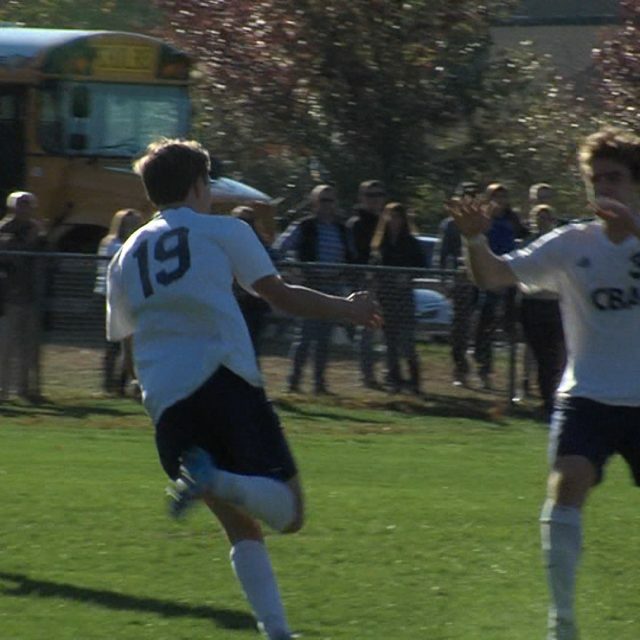 Freehold Township’s Tim O’Donnell hit the post with 16 minutes remaining to give the Patriots their best opportunity. 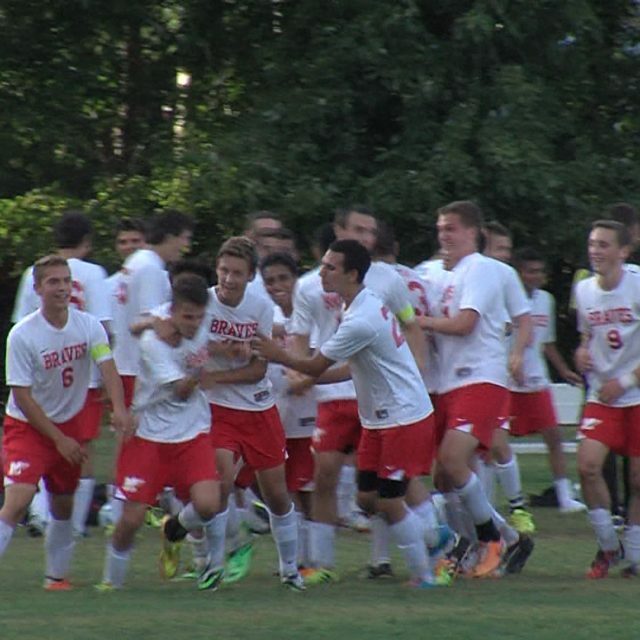 Manalapan is now 5-0-1 on the season. CBA 2 Howell 1 Russell Romano scored two minutes into the contest and John Frycz’s goal with 6 minutes to go in the first half proved to be the game winner for the Colts who now have won two straight games. Coach Dan Keane’s team improved to 5-3 on the year. 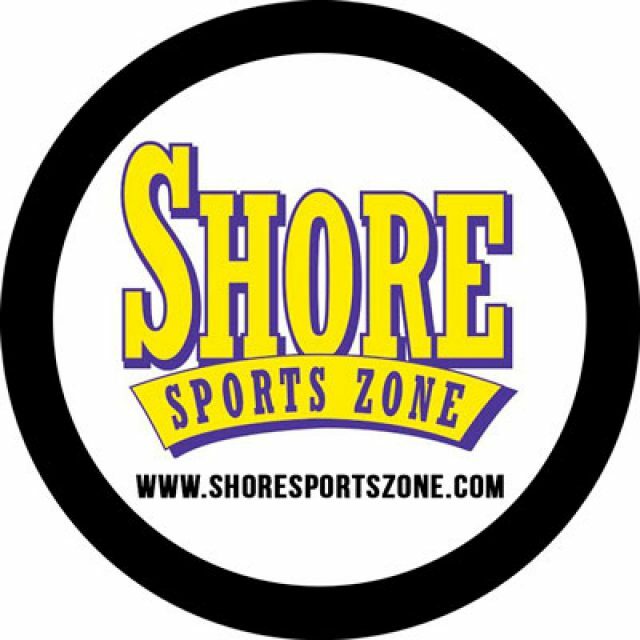 Shore Sports Zone brings you highlights of the Saint John Vianney girls come from behind overtime win at RFH and CBA scoring a road win at Freehold Boro. We also have the top scoring performances from Monday night! 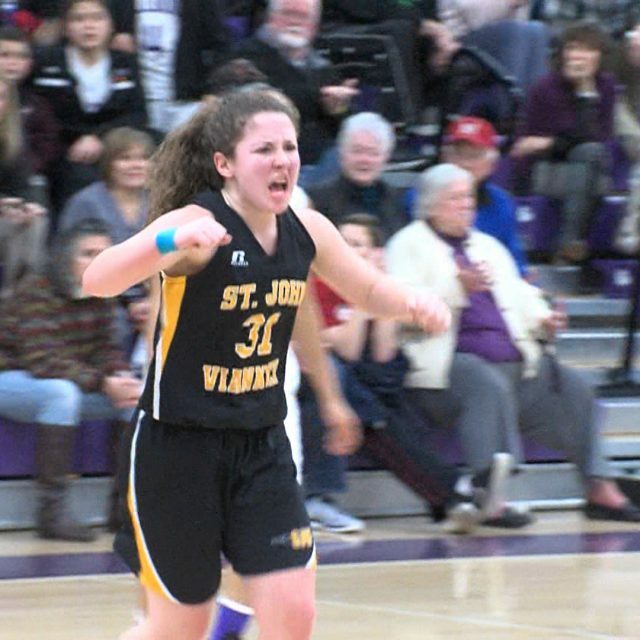 Click above to watch two games of Monday night hoops: * Saint John Vianney girls get a come from behind 58-52 overtime win at Rumson-Fair Haven. See all the big plays and post-game reaction from the Lancers * CBA fought off a valiant effort from Freehold Boro – first half highlights from the Colts 60-38 win against the Colonials Coaches – if your player isn’t on the list, make sure you email rich@shoresportszone.com or tag us on Twitter @ShoreSportsZone SSZ Hoops Honor Roll – Boys from Monday, December 22nd 1. Peyton Wejnert, South Regional – 35 points in an 84-65 win over Brick Township 2. 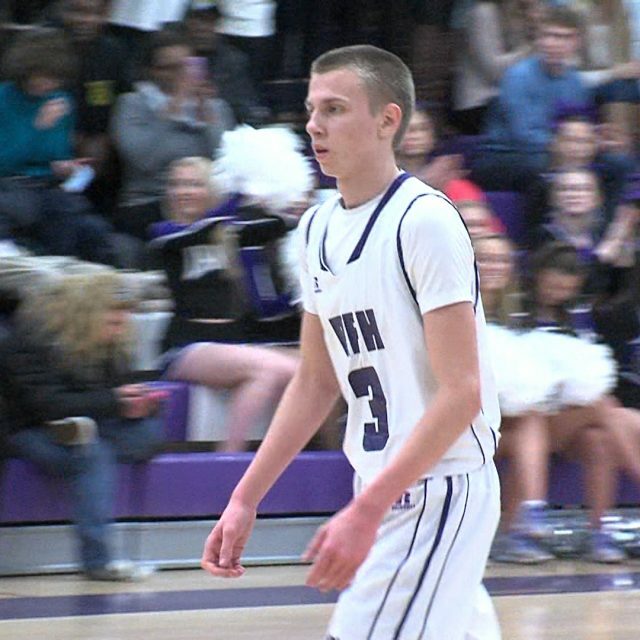 Brendan Barry, Rumson-Fair Haven – 34 points in a 82-63 win at Saint John Vianney 3. Joe Strand, Raritan – 27 points in a 53-50 loss to Holmdel 4. Jack Logue, Southern Regional – 24 points in an 84-65 win over Brick Township 4. Anthony Fernandez, Keyport – 24 points in a 55-53 loss to Asbury Park 6. Luke Mayell – Holmdel – 22 points in a 53-50 win over Raritan 7. Aidan McMenaman, Manasquan – 21 points in a 70-34 win over Monmouth Regional 7. Brian Oehmer, Brick Township – 21 points in an 84-65 loss to Southern Regional SSZ Hoop Honor Roll – Girls from Monday December 22nd 1. Marina Mabrey, Manasquan – 30 points in a 70-26 win over Monmouth Regional 2. Tracey Brereton, Matawan – 29 points in 53-50 win at Long Branch 3. Angela DeBartolome, Middletown South – 23 points in an 84-41 home win against Manalapan 4. Steph Karcz, Middletown South – 22 points, 12 rebounds 10 assists in an 84-41 win at home against Manalapan 4. Kamani Williams, Middletown North – 22 points in a 49-38 home win against Howell 6. Kelly Campbell, Saint John Vianney – 21 points in a 58-52 overtime win at Rumson-Fair Haven 6. Alexis Bennett, Keyport – 21 points in a 49-44 loss to Asbury Park What’s coming up this winter from SSZ Shore Sports Zone is excited to bring you winter sports coverage. In addition to highlights and shows on boys and girls basketball in the Shore Conference, SSZ will have two weekly promotions to showcase athletes on the hardwood. IPlay America Game of the Week Beginning in January, SSZ will post nominees for the IPlay America Game of the Week. If your game is selected, we’ll bring Shore Sports Zone T-Shirts that cheerleaders will throw out to the crowd and we’ll do extended highlights and post-game reaction from your matchup giving the top performers of the game SSZ shirts! 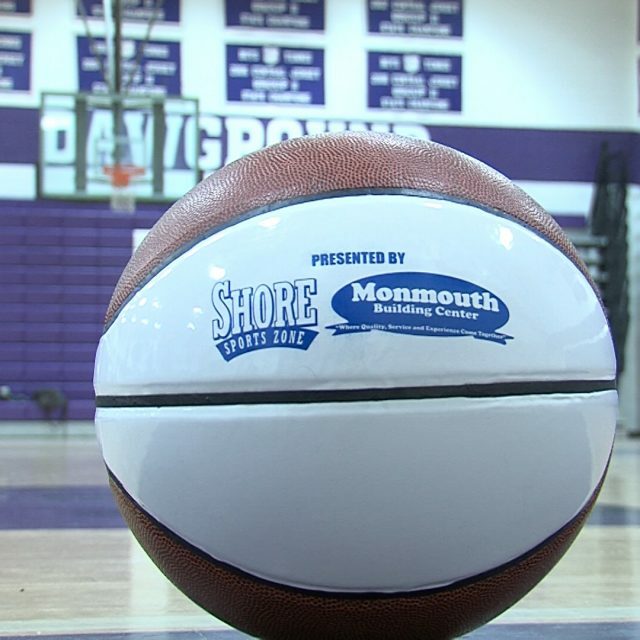 Monmouth Building Center Game Ball Every Saturday morning, we’ll look at the top performers from the week in high school basketball and ask you to cast your vote for a Monmouth Building Center Game Ball. 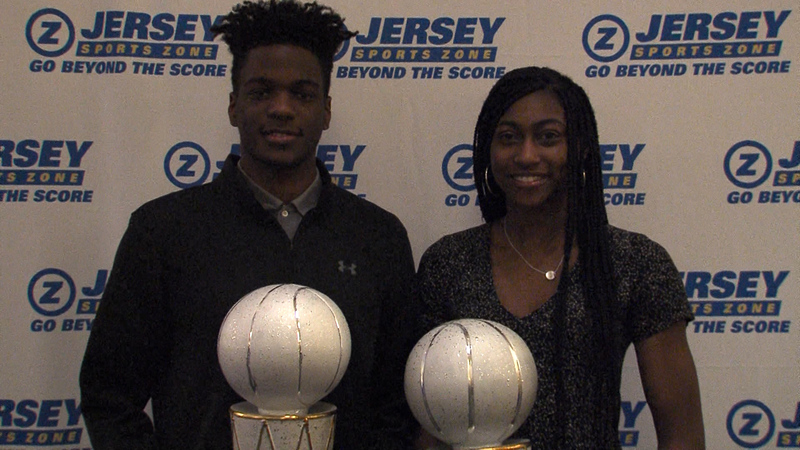 Each week, we’ll give SSZ Game Balls to a boys and girls outstanding performer! 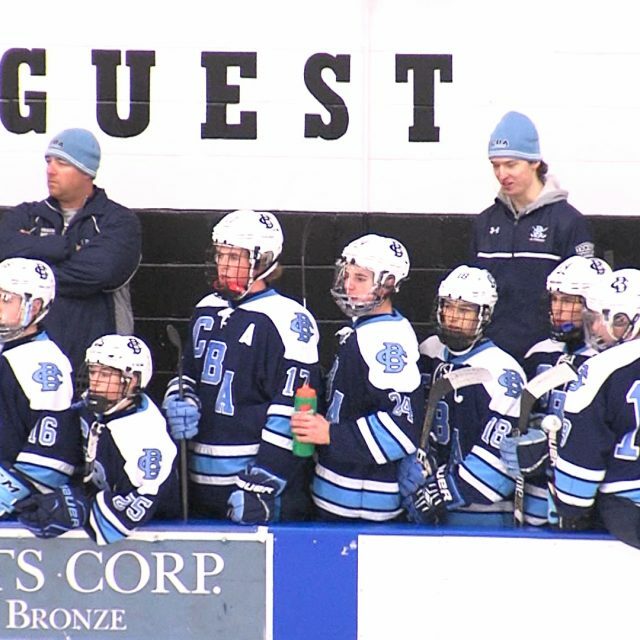 See highlights of CBA’s 10-1 win over Middletown North at Middletown Ice World MIDDLETOWN – Christian Brothers Academy erupted for eight second period goals on the way to a 10-1 win over Middletown North at Middletown Ice World. The Lions jumped out to a 1-0 lead, but CBA got the equalizer from Derek Contessa to knot the game at one after one period. 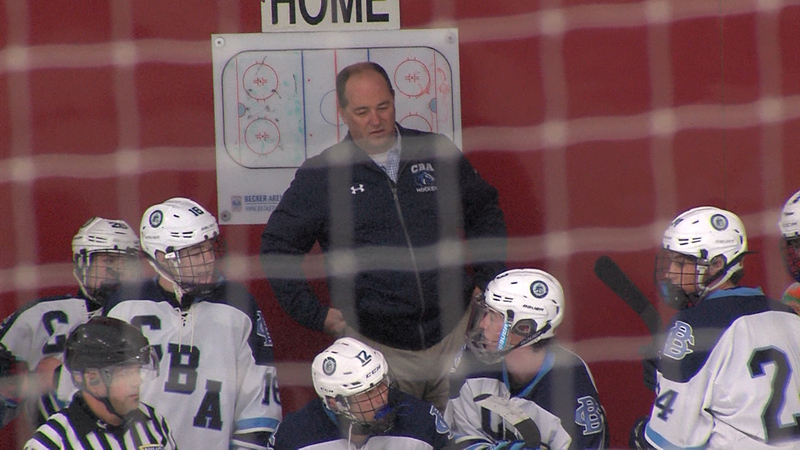 The second period was pure dominance by CBA. In all, seven different Colts scored in the victory. Christian Brothers Academy is now 11-0 on the season and will head outdoors for a Wednesday night matchup against Don Bosco Prep at Navesink Country Club. 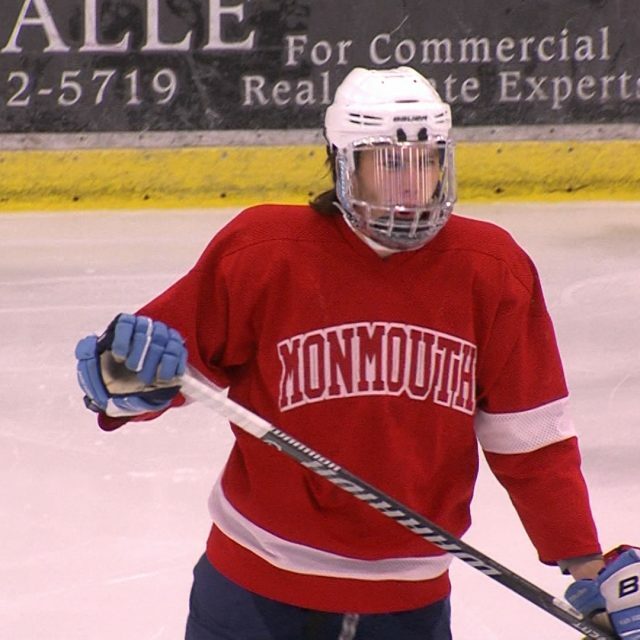 Shore Sports Zone will have highlights of the high school version of the Winter Classic. SSZ brings you highlights of all five games of the Boardwalk Hoop Group Showcase at Long Branch High School Shore Regional 58 Long Branch 36 – Dan Largey had 25 points as the Blue Devils cruised past host school Long Branch. 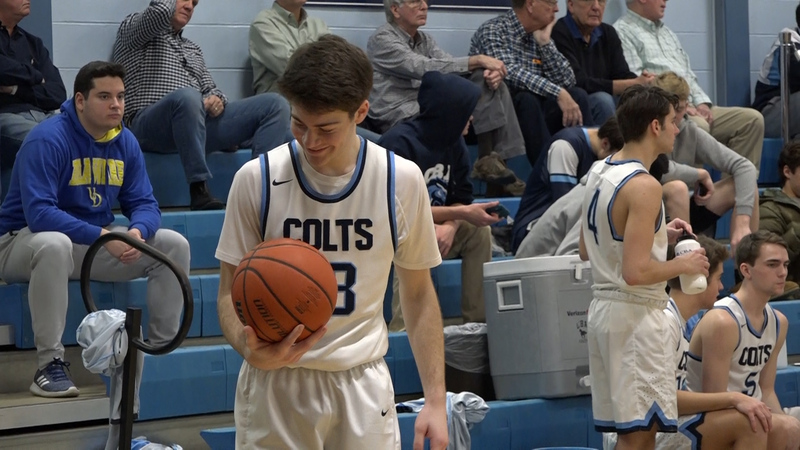 Click above to watch the highlights of Shore Regional’s win and a post-game interview with Largey Neptune 50 Lakewood 44 – The Scarlet Fliers raced out to a 15-2 first quarter lead and hung on for a six point win. Barry Brown had 18 to pace the Scarlet Fliers while Ryan Barksdale had 17 in a losing effort for the Piners. Watch highlights above and hear from Barry Brown on the win. Saint Anthony’s 60 CBA 35 – Taurean Thompson paced a balanced Friars scoring attack with 13 while CBA’s Pat Andree led all scorers with 17. 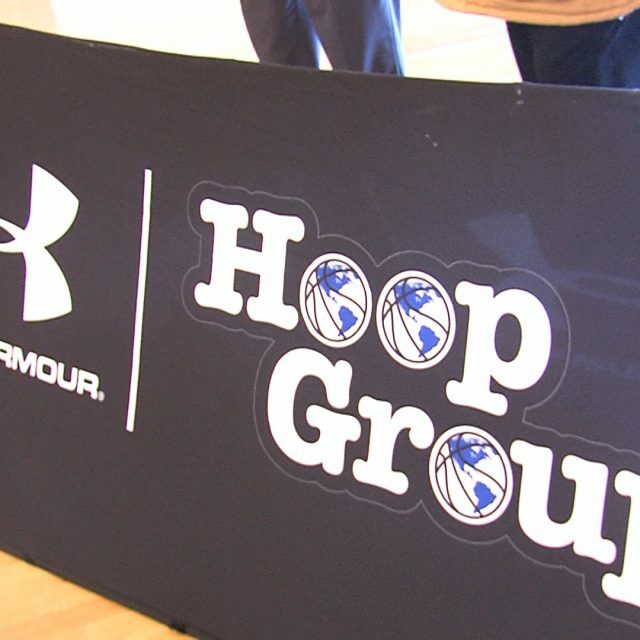 See the highlights above and hear from legendary coach Bob Hurley, Senior. Rumson-Fair Haven 57 Point Pleasant Beach 42 – Brendan Barry set a Boardwalk Showcase record with 34 points to pace the Bulldogs to an impressive win at Long Branch High. See the highlights and a post-game interview with Brendan. Manasquan 42 Matawan 40 – Luke O’Shaugnessy led the way with 15 points in a gutsy Warriors win. 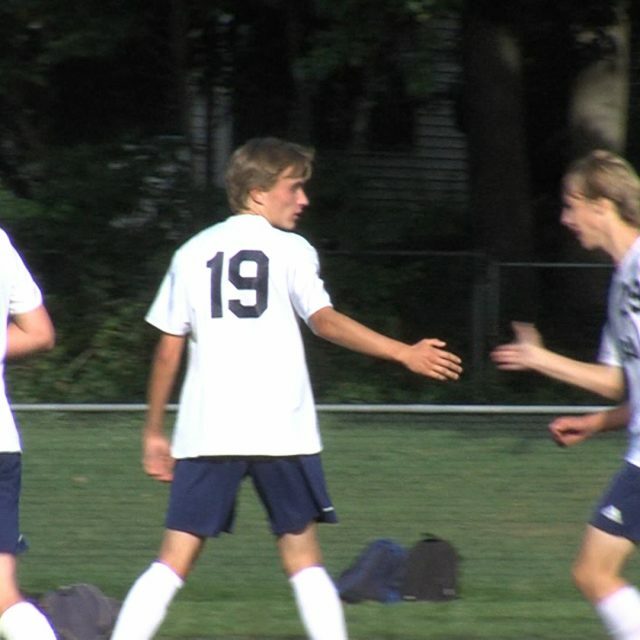 Manasquan was without two key players. Matawan came back from a 26-18 halftime deficit to get a shot to take the lead in the closing seconds, but a three pointer was just off the mark. Jason Dunne had 16, including his 1000th career point in the defeat. Vote now for first SSZ Game Puck! Watch 8 games from Tuesday hoops menu! 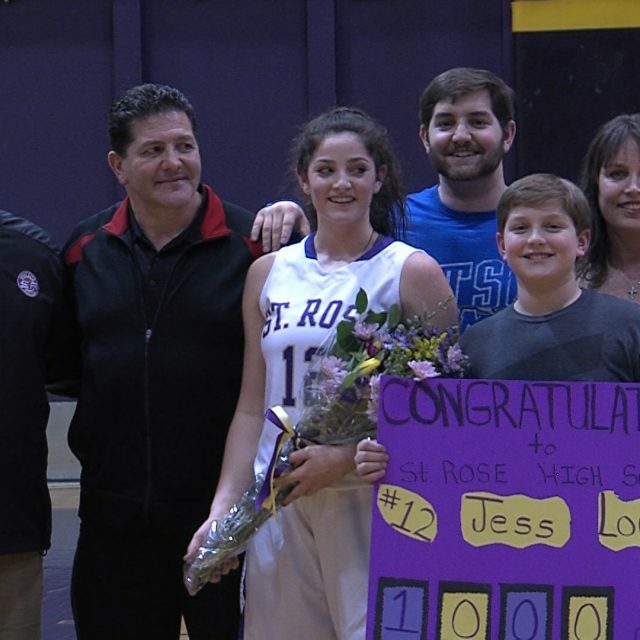 SSZ has a big Tuesday nights highlight show with eight games including milestones for Saint Rose’s Jess Louro, Neptune’s Marajiah Bacon and Manasquan’s Marina Mabrey SSZ has highlights of eight Tuesday night games highlighted by three milestones from girls basketball players * Jess Louro of Saint Rose hit the 1000 point mark – we’ll show you the bucket and celebration * Neptune’s Marajiah Bacon piled up 28 points including 1000 – we’ve got the three pointer and the celebration Neptune’s Marajiah Bacon celebrates her 1000th career point * Manasquan’s Marina Mabrey reached the 2,000 point plateau – we’ll show you some of her second quarter three pointers after she reached the landmark * We’ve got highlights of the Middletown North/Middletown South hoops doubleheader with the schools gaining a split * RBC and RBR go to overtime – we’ve got all the highlights and post-game reaction * Wall boys have made it eight in a row – we’ll show you the Crimson Knights win over Wall and post-game reaction SSZ Honor Roll – Top Boys Performances from Tuesday, January 20th 1. Amir Tyler, Lakewood – 29 points in a 76-43 win over Manchester 2. 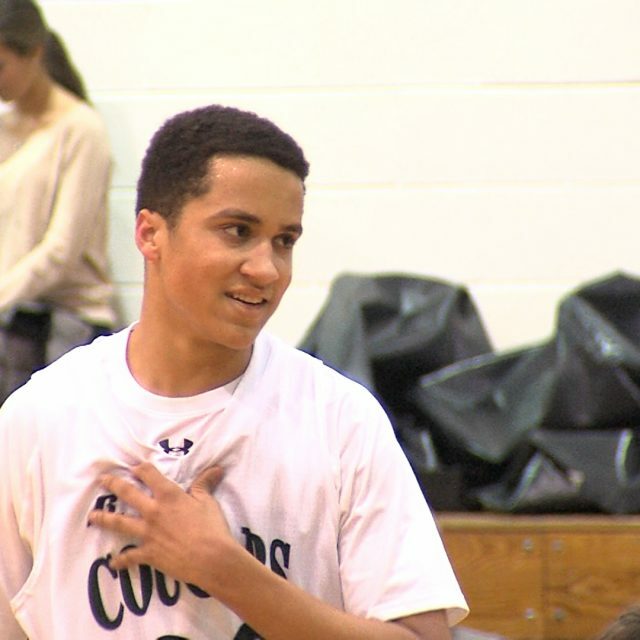 Tymere Berry, Toms River South – 28 points in a 70-66 win over Toms River East 2. Aaron Schiederman, Brick Memorial – 28 points in a 67-52 win over Brick Township 4. Chris Iapicco, Lacey – 27 points in a 65-41 loss to Southern 5. 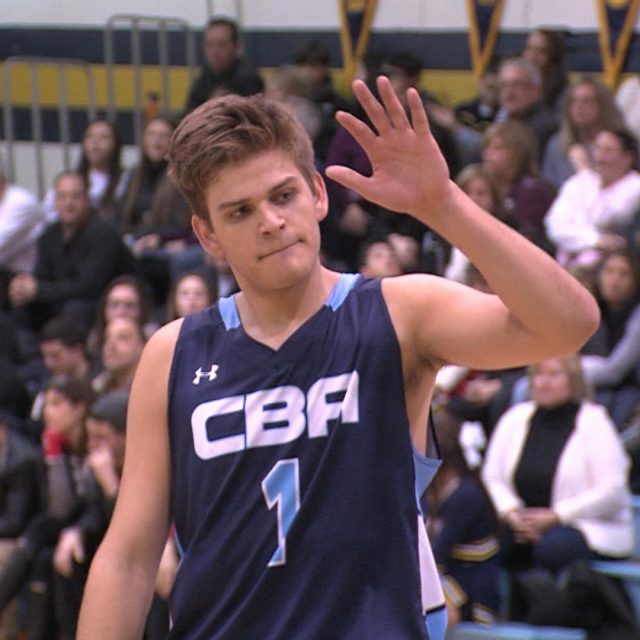 Jack Laffey, CBA – 25 points in a 77-59 win over Howell 6. Dan Largey, Shore Regional – 23 points in a 55-32 win against Holmdel 7. Khaleel Greene, Toms River South – 22 points in a 70-66 win over TRE 7. Ty’Suan White, Mater Dei Prep – 22 points in a 58-42 win over Asbury Park 9. Mike Rice, Point Pleasant Beach – 21 points in a 51-45 win against Henry Hudson 9. Pat Andree, CBA – 21 points in a 77-59 win over Howell SSZ Honor Roll – Girls Basketball for Tuesday, January 20th 1. Marajiah Bacon, Neptune – 28 points in a 75-54 win against Long Branch 2. Samantha Farmaluke, Freehold Township – 27 points in a 77-52 win over Manalapan 3. Marina Mabrey, Manasquan – 21 points in a 67-15 win at home over Raritan Vote for iPlayAmerica Game of the Week Voting is open through Thursday at 4:00 pm. We have three matchups in boys basketball, girls basketball and hockey. The game with the most votes gets extended highlights and post-game coverage and SSZ T-Shirts thrown to the crowd. Click HERE to cast your vote! Vote now for JSZ’s New Jersey Devils Hockey Goal of the Month! Vote for JSZ Soccer Plays of the Year! UNC or MLB for CBA duo? Vote now for 2016 Hoops Plays of the Year!! Vote now for SSZ Hockey Plays of the Year!